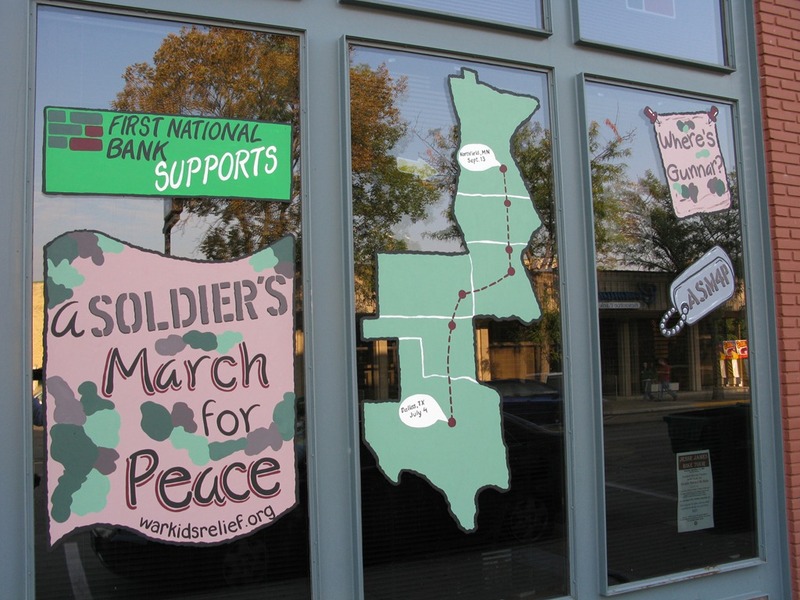 The other graphic on the First National Bank Northfield’s window is the Soldier’s March for Peace, part of the War Kids Relief project. 9/10, Thursday – Northfield: 5pm Gunnar will meet Northfield high school students in parking lot of NF HS and walk the last mile with him to Bridge Square in center of Northfield for Townie Night. Northfield always throws this and there will be food and fun stuff to do. Very family oriented. Actually EVERYONE is invited to participate in this…not just highschoolers. Looks like the DJJD royalty and the James Gang will be coming too! 🙂 There will be a reception in Bridge Square at 6:00pm. 9/11, Friday – Cannon Falls: 8am Gunnar and Dina will be at Cannon Falls Elementary to meet with all the students This will be amazing…don’t miss it! The entire Cannon Falls student body (pre-school through 12th graders) will gather to hear Gunnar’s and my final presentation (the one we have give to YMCA kids over the past 10 weeks) and then write letters for kids in Iraq and Afghanistan. They will also make a human tunnel from the elementary school to the high school for Gunnar to walk through..all wearing red, white and blue and holding flags. How cute! KARE-11 is coming to do a story on this as well. 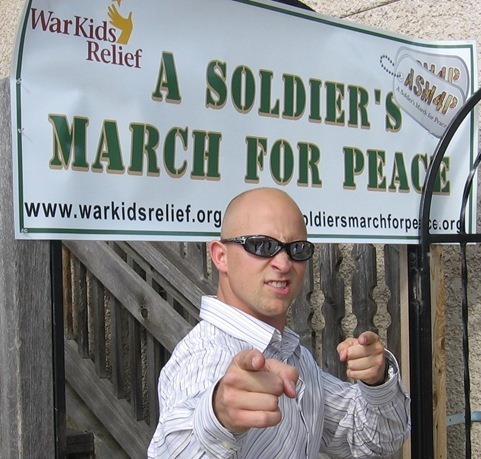 9/12, Saturday – Northfield: 4:30pm Gunnar will give "the" speech near Bridge Square where the big bank robbery showdown was and will be presented with a check from VFW. Yes, this will be before the 5:00 bank raid reinactment. The VFW and American Legion Honor Guard will be holding the flags to honor Gunnar as he makes a short speech and thanks all who supported/donated. Also, the VFW will be making a donation at that time, and any other local businesses who want to make a public donation can do it then as well.